When tax season rolls around, will you be prepared or among the scores of disorganized individuals scrambling to beat the filing deadline? To avoid falling into the latter category, get organized for the upcoming tax season. You can download the printable checklist below; just click on the image to download and print the pdf. This guide can give you further help if you need it. 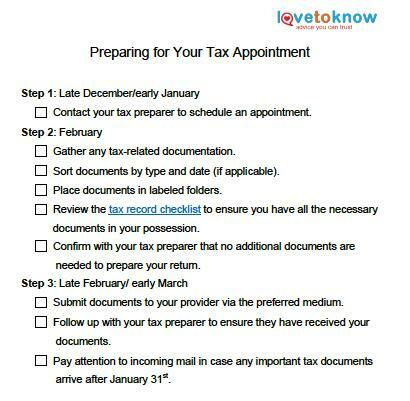 Download this tax preparation checklist. The annual tax deadline falls around mid-April each year, so don't wait until the last minute to schedule an appointment. Instead, call when tax season starts to secure your spot and avoid the last-minute rush, which sometimes results in more exorbitant preparation fees or sheer oversight from mentally fatigued preparers. If appointments tend to fill up fast, which is typical for preparers in high-demand, you risk of having to take your business elsewhere shortly before the filing deadline. Once you have made an appointment with a reputable tax preparer, it is time to get organized. Unsure of where to start? By all means, avoid piling all your receipts and tax-related documentation into a shoebox and heading to the preparer's office. These messes take more to sort out, which equates to more billable hours and money out of your pocket. As Karla Dennis, an enrolled agent, told Consumer Reports, "If you bring in the shoe box, your tax fees will escalate." A better alternative is to dump out the shoe box(es), sort the documents by type, arrange by date, and neatly file them away. That way, you will be able to access any forms or documentation requested by the tax preparer on demand. (Plus, he or she won't grow irritated at your lack of organization or unwillingness to prepare). Even more importantly, you will not risk missing out on deductions that could lower your taxable income or credits that could lower your total tax liability, as a result of misplaced paperwork. Once the documents have been sorted, place them in labeled folders that correspond with the categories mentioned above. Maintaining this filing system going forward will prevent the documents from piling up prior to subsequent tax seasons. Your tax preparer should have provided you with a list of documents needed to complete your return in the most accurate and timely manner possible. You can also view this comprehensive checklist for additional guidance. If anything mentioned on the checklist is not in your organized file of tax documents, be sure to collect it prior to the appointment, or there's a strong possibility the filing of your return will be delayed. By planning ahead and using the printable checklist, you will help simplify the tax preparation process and avoid the last-minute rush of taxpayers. In addition, it leaves an ample amount of time to discuss other pertinent tax matters that could yield cost savings in the current and forthcoming years.